"Emerging Economies & Management Practices"
On the 6th of October, 2012 The Department of management Studies at IIT Roorkee, hosted one of its biggest events of the year in collaboration with the THDC (Tehri Hydro Development Corporation), A Symposium on “Emerging Economies and Management Practices”. The event is conducted annually based on a particular theme. This event was organized in collaboration by the First and Second year students at the Department of Management Studies. India emerged from the shadow of socialism in the last decade of the last century, although it may seem as if this was eons ago, it has been barely two decades. In 1991 our then honourable Prime-minister, P.V. Narsimharao ushered in an era of liberalization which saw a rapid growth in the GDP of the country. India thus emerged from a cocoon of the permit raj system that sparked a revolution that made this country shine. Various policies were put in place which opened the doors to international trade, foreign investment, privatization, tax reforms etc. Over the past two decades, India has been hailed along with Brazil, China and Russia as the “emerging economies” that will be the engines of future growth. Thus an emerging economy may be defined as a country that satisfies two criteria: rapid pace of economic development and government policies favoring economic liberalization. Even though the BRIC nations have made significant progress economy wise, we have witnessed a slack in India over the last few years. What has changed? What needs to be done? What changes are required in today’s businesses to get us back on track? • Role of Business Groups in Emerging Economies. • Interaction between Industry and Academia and the impact these have on emerging economies. 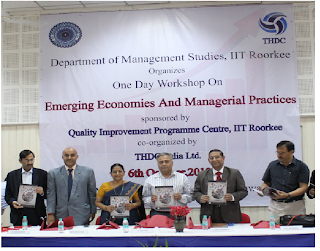 The Event was sponsored by the Quality Improvement Program which was represented by Professor Rama Bhargava. This Centre has been assisting many institutions across the country by publishing technical literature in the form of text books, monographs, laboratory manuals etc. and also keeping regular interaction with them for improving the standards of technical education. 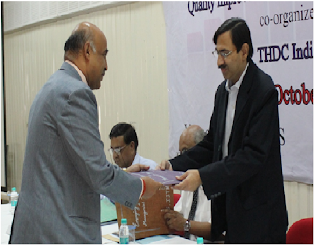 Various departments at IITR are participating in the activities sponsored by various QIP schemes. Till date, the Centre has helped in upgrading the qualification of about 348 teachers in Master of Engineering and about 477 teachers in Ph.D. programme from all over India. Further, it has conducted 206 Short Term Courses in which 3629 technical teachers have participated. Also the Centre has published 114 Monographs/Books, prepared 82 Multi-mode teaching aids, organized 70 Workshops/Seminars, prepared 21 Curricula and conducted several Special Lectures. This is the only QIP Centre in India, which has been given the responsibility for undertaking activities related to the Technical Education, Vocational Training and Skill Development of the disabled. 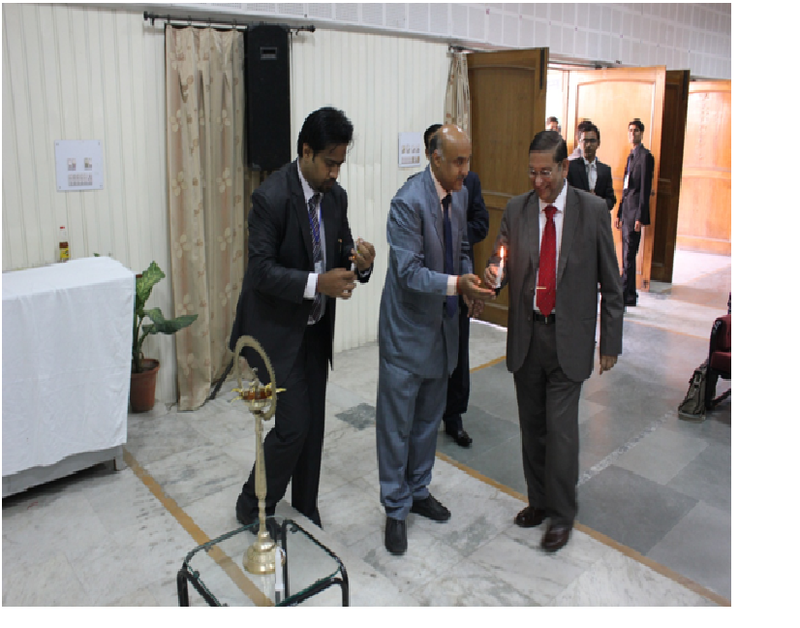 The session commenced with the traditional lighting of the lamp. 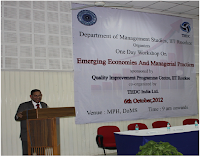 The forum was then addressed by the distinguished Head of Department Dr. S. Rangnekar. He shared some insights about the institution and the department in particular. 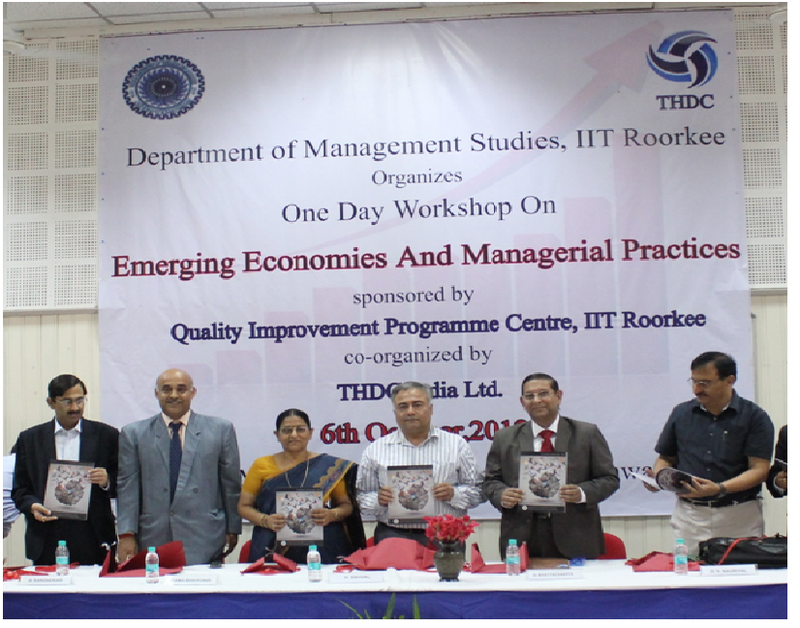 This was followed by a brief talk given by Prof. Rama Bhargava who is the coordinator of the Quality Improvement Program at IIT, Roorkee. She briefed the forum regarding the latest developments and achievements of the QIP center. The First speaker of the day was Professor D.K. Nauriyal from the humanities and social sciences department at IIT, Roorkee. Mr. Nauriyal’s session focused mainly on the BRIC Nations and how they would soon become a formidable force. According to him there is a considerable amount of industry growth in China as compared to India. Countries like Brazil, India and Russia rely more on the service sector where as China relies more on the Industry sector. 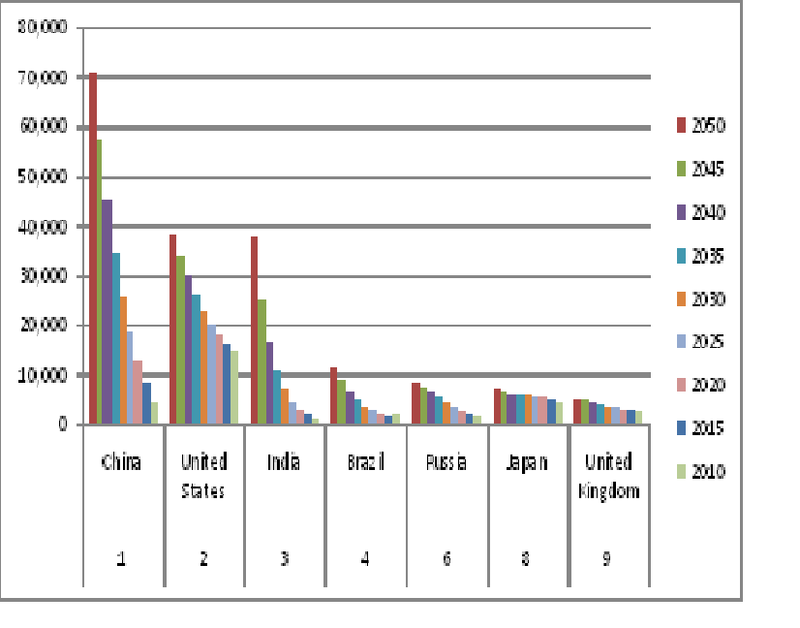 As a result China as a country provides more employment than all the other BRIC Nations. The unemployment rate in China is around 2.8 % whereas in countries like Brazil and Russia it is around 6%. The Table below shows a comparison of the BRIC nations. A comparison is shown below of the GDP in the coming years. 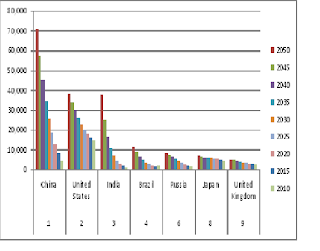 The figure clearly shows a larger increase in GDP of the BRIC nations as compared to other nations. It is estimated that by the year 2050 India and China will top the world in terms of GDP. Professor Nauriyal also stated that there may not be any miracles in terms of per capita GDP, although the standard of living is expected to increase drastically. Some additional interesting facts were also shared as mentioned below. 4. 26% of global GDP which will become 40% by 2050. He also threw light on the fact that four summits had already taken place and the fifth was scheduled to take place in South Africa in 2013. The question on everyone’s mind obviously was why South Africa? According to Prof. Nauriyal China currently dominated the BRIC nations and was looking to expand its markets. The BRIC nations also have a superior purchasing power. FDI has also been on the increase in such nations, the reasons for this being a large population which leads to a large amount of unsatisfied demand. The one problem according to Prof. Nauriyal was that the BRIC nations were not unified. There were border related issues between India, Russia and China. We were also joined by Mr. N.K. Gupta (G.M. (H.R.) from BHEL. The vision of the company is “A global engineering enterprise providing solutions for a better tomorrow”. The Mission is “Providing sustainable business solution in the field of Energy, Industry and Infrastructure”. Values of company comprise Governance, Respect, Excellence, Loyalty, Integrity, Commitment, Innovation, and Teamwork. He told us about the different opportunities at BHEL. BHEL is one of the Navratna PSU’s in India. According to him in an Emerging Market Economy, a country experiences development, Industrialization and economic growth. BHEL is basically an engineering company not a manufacturing company. They are more prominent in the Power, transportation, transmission, renewable energy resource and oil &gas sectors. This is an ISO-certified company. The total turnover of the company is approximately 50000cr.The Business Model of BHEL is divided into 3 parts that is the Power, Industry and Overseas sectors. The Industry sector is further divided into Transportation, Transmission and Inventory sectors. BHEL is the Leader in providing technology to various companies. It develops its own technologies. Its manufacturing strategy is to increase production, rate of stock removal and decrease cycle time. Its manufacturing Prowess can be compared to Organizations in China. HR functions of the company are Personal Relations and the HR development center. Personnel consists of Recruitment & Manpower planning, Executive establishment, Non-executive establishment, Industrial relation, Welfare, Terminal benefit cell, New initiative cell, Canteen, Administration & Sports, Corporate social responsibility etc. The HR Development Centre has skills in the areas of Management training, Research, Consultancy, Organizational Development and Manpower Planning. BHEL provides Non statutory welfare service through Township facilities, Medical services, RECHES (Relieved employee contributory health services), Educational services, Sports, Clubs and the Community center. We were also fortunate enough to have Mr. Manoj Sadavarte, Unit Head at Godrej & Boyce, Bhagwanpur with us. He started by addressing problem in our society like Poverty and a complete brain drain faced especially by our youth today. According to him another concern was a large number of undergraduates moving away to other countries. This is a major problem today. Our country gives us the education we need, however instead of giving back we head out to serve other countries. He stressed on the importance of guidance that should accompany the regular curriculum in institutions to instill a sense of belonging and national pride in students such that they choose to work for the betterment of our country. He also threw light on the fact that students in our country often study just from an examination point of view. The competition in our country has reached a level where getting grades has become more important. Somewhere along the way we have lost out on the need and importance of studying for knowledge. It is this knowledge that helps improve the condition of society. Those who have gained sufficient knowledge seldom work for the betterment of society. Most of them work for monetary gains. According to him a complete transformation is needed. At the end of each session Interviews were conducted by the Newsletter team at the Department of Management Studies. Profile- Chief Training & Quality Officer at SPANCO. 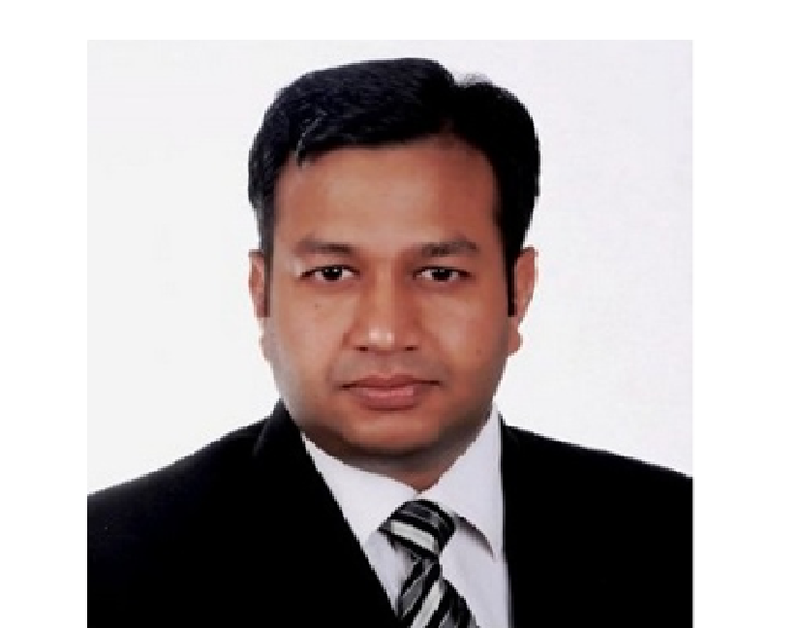 Mr. Vineet Suri is currently working as the Chief Training and Quality Officer at SPANCO. 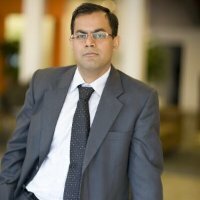 He has previously been associated with organizations like Tata Sky Ltd. and Mahindra & Mahindra. He has earned an MBA Degree in Operation Management from Punjab University. He is a specialist in fields like Operations Management, Customer Service, After Sales Service, Call Center Management, Quality Management, Business Excellence, Customer Satisfaction, Vendor Management, Six Sigma, BPR, Learning & Organization Development, Change Management etc. N.T) You have pursued an MBA in operations in 1990. What prompted you to take the decision as it was an uncommon choice of higher education back then? V.S) I mainly did it because I wanted enhancement of skills along with improvement in leadership and interpersonal skills. I also wanted jumps in my career. N.T) Having worked in such diverse fields and positions of responsibilities, how have you been able to manage the organizational cultural change from one organization to another? And where did you find the transition to be the easiest? V.S) My main transition was from manufacturing (working for 15-16 years) to the service industry. What I have noticed is that there is no difference in principles; the basics remain the same whatever the domain may be. The change is felt by the customer only. N.T) A leader must be equipped with a set of competencies necessary to perform his/her role. Which one would you say are the most important abilities a leader should have? V.S) According to me, a leader should be a good team player. His interpersonal skills should be great and he should be a good time manager. N.T) If you could instantly change any aspect of business, what would it be? V.S) If it were possible, I would like to change the mindset of people because in my career, I’ve noticed that people lose hope very quickly. N.T) As conflict management with clients is an essential part of your work, can you cite an example where you were successful in negotiating and resolving a critical issue? V.S) I was the Unit Head of National Panasonic at Noida, U.P. way back in 1998. We used to manage problems by revolving workers and introducing incentive based programs (increase in salary if a worker stays for six months, one year etc; there were different slabs). We had a transparent system comprising newsletters, e-mails, bulletins and most importantly, our workers used to repeat the mission statement every day. This improved their awareness. The workers were also asked about their expectations from the management. N.T) Sir what would your suggestion be for any B-School, which wishes its students to be closer to the industry expectations? V.S) Focus of studies should be more on applications. I believe that we need to bridge the gap between theory and practical in order to make budding managers like you industry-ready. N.T) Thank you for your cooperation Sir. Mr. ParveenBansal is currently working as the regional head at IL&FS Education and Technology Services Ltd. He has worked with 3i Infotech Limited previously. He has earned his MBA Degree from The Department of Management Studies, IIT Roorkee. His domain of specialization includes Education, Skill Development, eGovernance, UID, Health and Cluster Development initiatives etc. He has also played a vital role in strategic planning and business acquisition. Profile- Regional Head at IL &FS. N.T) How much you have been able to impact the education sector w.r.t. infrastructure? P.B) Our major emphasis is on the PPP model. We’ve been setting up computer labs in govt. schools across the country. We hope that this will make an impact on the education of young children. N.T) How have you dealt public-private partnership and what is your basic business model? P.B) Essentially, our business model is two-faced. 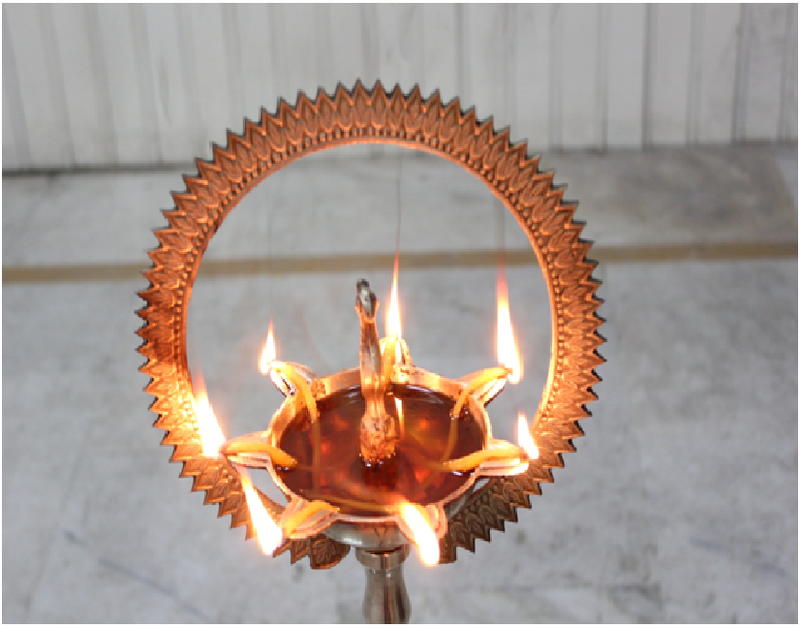 We charge from industries (infrastructure, machines etc.) for giving them skilled manpower. We also charge from interns for giving them skilled training. We have three verticals: Physical infrastructure (roads, bridges etc. ), financial infrastructure (planning, analysis etc.) and social infrastructure (CSR, rural development etc.). However, infrastructure is a long term investment and major players are coming up to challenge the paucity of funds. N.T) Can you explain more about your Strategic Business Unit? P.B) Our new SBU consists of trainers that are provided by us, but all the other facilities are provided by the industry. We train basic workers and equip them with the knowledge to work at par with industry standards. This is a niche task that we perform for our industry partners as skilled labor is very much required for their specific tasks. We get the benefit of getting paid for both the ends. N.T) In your opinion, what are the major roadblocks that are there in improving the education sector in India? P.B) Slow decision making by the govt. is a major roadblock. Moreover, there is no upfront payment since the return is only after five years and the risk is borne by the private partner only because of the revenue sharing agreement. N.T) How would you define “success” for your career? How has life been for you post DoMS, IIT Roorkee? P.B) Success means the enjoyment of the work that I do. And my definition of success is evolving every day. As far as life post DoMS is concerned, I’ve learned one thing: Management is not rocket science. Keep everything simple and apply common sense irrespective of your domain! P.B) Curriculum should be based on the basis of industry interaction, like we have this 8 year “skill development” project in collaboration with BSNL in Haryana. Students should have exposure to such projects in order to understand “management concepts” better. Mr. D. Bhattacharyya is presently working in the capacity of Sr. Executive Director (HR), MKCO at Corporate Office, New Delhi. He joined IFFCO in New Delhi in March 1988. Prior to his joining IFFCO, he has worked in Hindustan Motors Ltd., Kolkata, Heavy Engineering Corporation, Ranchi and Hindustan Zinc Limited, Udaipur. He has over 36 years of experience in the field of Industrial Engineering and Human Resource Development. N.T) What were the changes you saw before and after the implementation on KRA (Key Result Area) and KPI (Key Performance Indicator) based PMS (Performance Management System)? Is this methodology is more effective in some sectors relative to others? D.B) What I believe is that we shouldn’t blindly follow PMS, KPI etc. The performance should be connected to one’s values i.e. the concept of social boundaries. This basically means that we need to see soft skills along with technical skills. N.T) Sir what are your views on FDI? Do you think it should be implemented or are there better measures? D.B) I believe that these foreigners come for “their” economic interest. Merely bringing FDI won’t help farmers. FDI shouldn’t be at the cost of the lack of governance at our end. We need to improve our existing infrastructure. Why can’t Indian traders give a better price? The need is to reach the grassroots level and improve our education. This will help eradicate child labor too. N.T) What do you think are the problems affecting the rural population, particularly farmers? D.B) Migration of rural population to urban areas causes pressure on urban infrastructure. Thus we need to create employment in rural areas. Govt. should have strong vocational training programs for people below poverty line and the govt. should also invest in cooperative societies. Besides, we need to focus on irrigation facilities and also on improving the yield of the land. We shouldn’t be dependent on the monsoons! This will help the plight of the farmers. N.T) Can you tell us something about the organizational culture at IFFCO and how do you promote employee engagement? D.B) I have always believed that IFFCO is not an organization: it is like a big family. Let me share an example with you. I’m treated like a father figure and many a times, I even counsel in the family matters of employees. So you can guess that we follow a very open culture. We organize trips for the workers from time to time. Thus, you can say that we are one close knit family. N.T) Can you please shed some light on leadership identification and development? How do you define leadership? D.B) According to me, “Lead yourself first, others later”. I believe in Servant leadership model i.e. selfless service to others because serving people equals serving God. You need to be a sage by heart and a king by action. Choose the right mentor and exhibit positive emotions! N.T) How would you define “success” for your career? At the end of your work life, what should be present for you to feel as if you had a successful career? D.B) Success as I already mentioned is the feeling of contentment you get on serving others. The satisfaction you feel is immense. My pride is the pride of IFFCO. Mr. Pranay Kumar is currently working with Asma Energy (P) Ltd and VasudhaecofriendsProjects (P) Limited. He has previously been a part of Landmark Education Inc. He has studied Entrepreneurship and Strategy at Harvard University. Present Focus: Sustainable Innovations, Biodegradable products, Waste management and Low cost solar energy solutions. Solar energy domain: Solar farms, Strategy, Innovation and end consumers' issues, Major technologies and future strategy of different solar energy players. His other interests include Nanotechnology, Micro-grid, Inexpensive renewable energy products for rural applications, Smart Grid, environmental products. N.T) Can you elaborate on the entrepreneurial ventures you own and manage? N.T) What are the entry level barriers in the sustainability innovation field? P.K) Customs rules for Bio degradable plastic additives are a big hindrance. Besides, here in India there’s a mindset of “non-innovation”. Also, my partners are in different countries, so there can be such problems too. N.T) Sir as a young entrepreneur, what has been the most challenging decisions you have had to make in your professional career? P.K) No doubt, the biggest challenge is selling. If there’s anything associated with cost, the customer needs to be convinced. In our business model, we’re ready to innovate if the customer wants! N.T) Sir what according to you is the need of the hour for the field of sustainability and renewable energy in India? P.K) Definitely the need of the hour is: good marketing teams who can innovate! Also I think that people shouldn’t lose their heart too soon. N.T) As in your business the need for innovation is of paramount importance, what steps have you taken to promote innovation at your company? P.K) This is rather easy. Our whole team believes in the principle: “Anything is possible by asking how it can be done.” We encourage debate and subsequent questioning! N.T) How would you define “success” for your career? At the end of your work life, what should be present for you to feel as if you had a successful career? 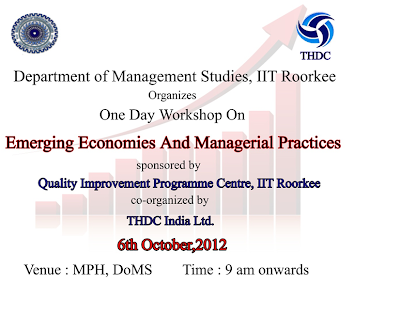 What message would you like to give the students of DoMS, IIT Roorkee? P.K) For me, the Definition of success is: How much impact has been made? I enjoy doing my work, so for me, the level of enjoyment is a success. For this field, your personality should mimic nature! You should go for two things in life: Self- belief and self-inquiry. Have fun coz everything is a matter of perception! Please format the post properly. It would be better if the post could be broken into parts so that it looks compact and readable.